This is a list of options found in debug (DEX) firmware. Not all of them are working in Rebug so have play around for yourself. This is a list of debug settings available on a Debugging Station. These settings help developers to debug and test applications. Switch the assignment of the ”O” button to ”X” button (like for japans games/region settings). – ”Back” : assign the ”Enter” function to ”X” button. ”prod-qa” : production quality assurance network. Note : There are other networks than debugs can access but only QA flagged consoles can connect to them (mgmt, rc, etc”¦). – ”Disc Boot Game” : use application like a game disc. – ”HDD Boot Game” : use application like a HDD boot game. – ”Patch” : use application installed as a game patch. – ”PARAM.SFO” : use the param.sfo directly from the application. – ”Off” : deactivate the BGM Player. – ”On” : activate the BGM Player. – ”For Development” : return the real path where the application is started. – ”For Release” : return the path from ”GameContentUtil dirName (Debugger)” setting. Change the console settings (system language, time, date, etc”¦) depending on which region are selected. Fake the license area of the console (”SCEE” for Europe, ”SCEA” for America, etc”¦) to ”Other”. – ”Off” : the Fake Other Region setting is deactivated. – ”On” : the license area is set to ”Other”. – ”Off” : the HDCP protection is deactivated. Display the hard drive free space on the menu screen while an application is running. Fake the amount of free space on the HDD, in ”Fake Limit Size” function. – ”Off” : deactivate Fake Free Space function. – ”On” : activate Fake Free Space function. – ”On (Ignored in NP Trophy)” : activate Fake Free Space function exept for trophy functions. Set the amount of free space on the HDD in MB when the ”Fake Free Space” function is activated. Allows use of save data from other users and displays a warning message at every load/save during the game. Once a save data has been saved with this features activated, that save couldn”™t be read with this function deactivated. – ”Off” : deactivate the Fake Save Data Owner function. – ”On” : activate the Fake Save Data Owner function. – ”Yes” : format the system cache. – ”No” : cancel the system cache format. – ”Development Mode” : the application can used /app_home. – ”Release Mode” : the application can”™t use /app_home. – ”Off” : deactivate the exception handling. – ”On” : activate the exception handling. – ”Off” : deactivate the NP Debug function. – ”On” : activate the NP Debug function. – ”Off” : deactivate the NPDRM Debug function. – ”No Entitlement (80029513)” : return 80029513 error. – ”Deactivated (80029514)” : return 80029514 error. – ”Unexpected Error” : return unexpected error. – ”Off” : deactivate the NPDRM Clock Debug function. – ”On” : activate the NPDRM Clock Debug function. – ”Off” : deactivate the MsgDialogUtil Display Errorcode function. – ”On” : activate the MsgDialogUtil Display Errorcode function. – ”Quick Format” : Make a quick device format. – ”Full Format” : Make a full device format. – ”Off” : do not disable the ExitGame Timeout function. – ”On” : disable the ExitGame Timeout function. – ”Copy” : Copy a core file. – ”Delete” : Delete a core file. – ”Disable PPU exception detection” : PPU exception are not includes in the core file. – ”Disable SPU exception detection” : SPU exception are not includes in the core file. – ”Disable RSXÂ® exception detection” : RSX exception are not includes in the core file. – ”Disable Foot Switch detection” : the foot switch detection is deactivated. – ”Disable Memory Dump” : the memory dump is not include in the core file. – ”Enable restart process and core dump function after core dumped” : After a core file dumped, the process will restart and the core dump function activated. – ”On (Save to /app_home)” : activate the core dump function and save the core file to /app_home. – ”On (Save to /dev_ms)” : activate the core dump function and save the core file to /dev_ms. – ”On (Save to /dev_usb)” : activate the core dump function and save the core file to /dev_usb. – ”On (Save to /dev_hdd0)” : activate the core dump function and save the core file to /dev_hdd0. – ”Off” : deactivate the Crash Report function. – ”On” : activate the Crash Report function. – ”Off” : deactivate the PowerOnReset function. – ”On” : activate the PowerOnReset function. – ”Debugger Mode” : boot on the debugger, for debugging purpose. – ”System Software Mode” : boot on system software mode, for developing purpose. – ”Release Mode” : boot on release mode, the same than retail console, for finals tests purpose. – ”BD Emulator (USB)” : use an usb hdd formatted for the BD-Emulator. – ”BD Drive” : use the Blu-Ray Disc drive. – ”HDD Native” : maximum transfer rate. – ”Equiv. to BD Drive” : same transfer rate than the BD Drive. – ”Single Settings” : use the same network settings for debugging than settings used in [Settings] > [Network Settings]. – ”Dual Settings” : use two different network settings. Note : the ”Network Settings for Debug” function have to be set on ”Dual Settings”. – ”Off” : deactivate the Pad Auto Detect function. – ”On” : activate the Pad Auto Detect function. – ”Yes” : reset boot parameters. – ”No” : do not reset boot parameters. – ”Off” : the Video Upload Debug function is deactivated. – ”On” : the Video Upload Debug function is activated. – ”Off” : deactivate the Wake On Lan function. – ”On” : activate the Wake On Lan function, the console can be turned on by a network message. Change the clock time of the * Title Store Preview (Store). – ”Off” : the PlayStation ®Store Ad Clock function is deactivated. PlayStation ®Store Ad Clock function is activated. This function checks how applications react while the XMBâ„¢ in game is used. If the resources debits are not enough, a message will be display in the notification window. – ”Off” : the Dummy XMB(in game) Debug function is deactivated. 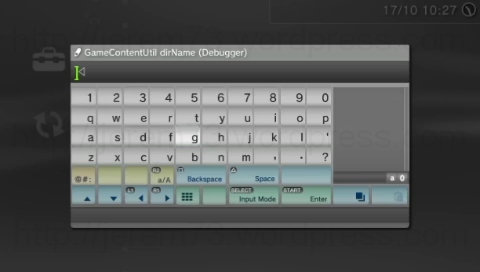 – ”On” : the Dummy XMB (in game) Debug function is activated. – ”Off” : the Dummy BGM Player Debug function is deactivated. – ”On” : the Dummy BGM Player) Debug function is activated. – ”Off” : deactivate the GameUpdate Impose Test function. – ”On” : activate the GameUpdate Impose Test function. – ”Off” : the Network Emulation Setting function is deactivated. – ”Option 1” : the Network Emulation Setting function is activated (packet delay time : 100ms). – ”Option 2” : the Network Emulation Setting function is activated (bandwitch limitation : 132072 bps). – ”Option 3” : the Network Emulation Setting function is activated (send packet loss : 5%). – ”Off” : the MediatedServices Notifications function is deactivated. – ”On” : the MediatedServices Notifications function is activated. – ”Off” : deactivate the wireless LAN device. – ”On” : activate the wireless LAN device. Set the prefix name of the Ad-hoc SSID”™s. The default value is set for PSP devices. – ”Off” : deactivate the Disc Auto-Start at System Startup function. – ”On” : activate the Disc Auto-Start at System Startup function. – ”Automatic” : video output settings are automatically set. – ”On” : force the 3D video output. – ”Off (60 sec)” : the Fake NP SNS Throttle function is deactivated, the throttling is set to 60 seconds. – ”On (0 sec)” : the Fake NP SNS Throttle function is activated, the throttling is set to 0 seconds. – ”On (10 sec)” : the Fake NP SNS Throttle function is activated, the throttling is set to 10 seconds. – ”On (120 sec)” : the Fake NP SNS Throttle function is activated, the throttling is set to 120 seconds. – ”On (3600 sec)” : the Fake NP SNS Throttle function is activated, the throttling is set to 3600 seconds. – ”On (Throttle Closed)” : the Fake NP SNS Throttle function is activated, the throttling is deactivated.